In everyone’s life, an opportunity comes along to stand up and defend something you really believe in. During the last six months, we at the Guelph Public Library have been reviewing, evaluating, and defending the 35-year-old bookmobile service. Our bookmobile serves 3,000 seniors, preschoolers, and at-risk youth across the city and provides reading material to which they would not otherwise have access. We go to those who can’t come to us. 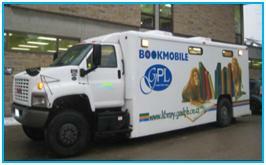 In many cities, this service has been abandoned, but in Guelph, Ontario we are passionate about our bookmobile. In our recent defence of this service, what have we learned? Never underestimate the power of a mob. Whether seniors, staff members, or city councillors, they can move mountains! During a crisis, library leaders need to evaluate the situation immediately, focus on actions (not blame), deploy staff quickly, and clearly articulate the path to resolution. If you are slow off the mark, folks will jump to their own conclusions, presenting you with an even bigger quandary. Get out of the gate without delay and keep the team informed as you search for the right steps to remedy the situation. Defending the bookmobile service taught us how to deploy a task force and how to benchmark (comparing the service with other libraries). We facilitated a SWOT analysis (by evaluating the service’s strengths, weakness, opportunities, and threats) and rolled out a marketing plan. These tasks required skills that every library should be able to implement at a moment’s notice. It’s not over until it’s over. Our staff, board, and supporters rode a rollercoaster of ups and downs as we worked to review the service and present it to the city council with a request to restore funding. It was essential to keep the team up-to-date and confident. The unknown often is more frightening than the known. The Guelph City Council made their final decision this past Monday evening allowing the mobile service to keep rolling. We are thrilled! This situation was a very real reminder to say thank you, thank you, and thank you again. Expressing gratitude never loses its power to encourage, strengthen and build confidence. To all of those on GPL’s Team Bookmobile: thanks, thanks, and thanks again. Long may she be on the road serving those in need. Subscribe to comments with RSS	or TrackBack to 'Defence 101. #21: 2011'. As a child in Toronto (Downsview, North York), I often visited the bookmobile in addition to being taken to the library by my father on a regular basis. These visits standout in my memory and as a result, contributed to my becoming a life-long reader. It is vitally important to be exposed to a wide variety of reading material which not only entertains and engages us but helps to make us critical thinkers. The bookmobile is not frivilous but a necessity to creating well-rounded, critically thinking citizens.